We have known for a very long time that lifestyle, such as diet and exercise, affects our health and well-being. But, did you know that social isolation is directly linked to decreased longevity? That’s right! More than cigarette smoking and even obesity, living alone and being isolated can shorten our lives. Not only that, the quality of our shortened life is at risk with social isolation potentially contributing to dementia. [i] When we think about healthy aging, then, we need to consider not only a healthy diet and exercise, but also how we can actively participate in groups to constantly make new friends and experience a sense of belonging and community. Two innovative local programs in Massachusetts provide just such opportunities – Revive and Thrive, at the Andover/North Andover YMCA’s Aging Wellness Center; and Andover’s Memory-Making Cafe at Salvatore’s Restaurant. Revive and Thrive: A Dementia-Friendly Program: The Aging Wellness Center at the Andover/North Andover YMCA is now offering an innovative, cutting-edge program promising to reduce isolation and increase wellness and engagement for people living with dementia and their care partners. Others who could benefit from a slower-paced fun workout are welcome, as well! 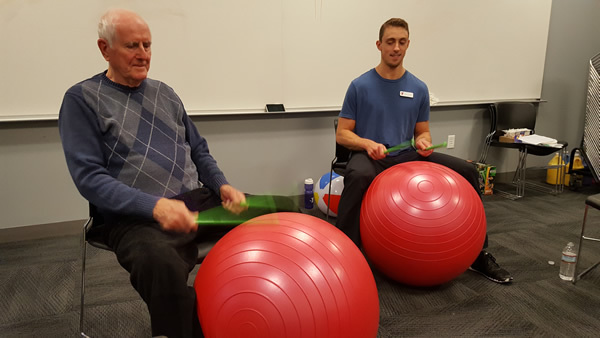 Revive and Thrive: A Dementia Friendly Program is an unparalleled health and wellness program offering adaptive physical and mental exercise through small group engagement. Revive and Thrive is a two-for, offering individuals living with dementia a fun fitness program while their care partners enjoy a much-needed, and well-deserved, short break for restorative respite. This program is led by Emily Kearns, PhD. She is assisted by Merrimack College Exercise Science graduate students. Memory-Making Café: Emily Kearns is also Coordinator of Dementia Friendly Massachusetts and Andover’s Memory-Making Cafe, held monthly on a Monday night at Salvatore’s Restaurant, in Andover. There are more than 75 memory cafes throughout Massachusetts. (Find a list of cafes across the state at the Memory Café Directory at www.dfmassachusetts.org.) The Memory-Making Café is a free, monthly event creating opportunities for individuals living with memory challenges, their caregivers, families and friends to come together for a light-hearted social event – for memory-making. Each café has a specific theme and activity facilitated by a presenter aimed to stimulate shared connection and joy. Local businesses and private individuals and families help off-set costs through sponsorship by adopting a café. There is a free, online toolkit available if you would like to consider starting a café. The YMCA’s Revive and Thrive and Andover’s Memory-Making Café programs are part of an exciting dementia-friendly movement supporting people living with dementia and their families in continuing to lead meaningful, and purposeful lives – in community. This movement is raising awareness through innovative trainings and cross-sector collaborations to slow us down and to create meaningful engagement for all members of our communities. This is so important – especially in this time in history where our daily lives are increasingly fast-paced and digitized, requiring us to navigate basic daily functions with technology. Those living with cognitive challenges are too often left behind, unable to keep up with their fast-paced, digitized community. Consider an ordinary day in which even small pleasures and basic necessities require technology savvy: making coffee, watching TV, using an ATM, checking email, listening to the radio or using GPS while driving, paying for parking, and more. Consider, too, that access to our connections and information requires knowing login PINS and passwords, which remote operates what, how to operate credit card swiping, and more. In our information and technology-based society, those of us who can manage all of this are valued and easily included in our community activities. Those who cannot are devalued because they “slow us down” at work, at home, on the roads, and in our stores. In these times, they are more isolated than ever and, too often, rather than risk being humiliated and scorned by our impatience, remain at home. Beyond becoming invisible, people living with dementia and their care partners are feared – perhaps because they remind us how dependent we are on the data-processing mind in this age of accelerations, as writer, Thomas Friedman calls it in his new book, Thank You for Being Late. They often experience terrible social isolation because of society’s dementiaphobia. Coined in Psychology Today in 2013, dementiaphobia refers to a pervasive fear and stigma attributed to those living with dementia. Revive and Thrive, and memory cafes are part of a culture-change effort offering good news! The Dementia Action Alliance is led by people living with dementia and is encouraging communities to become more inclusive and supportive of those living with dementia. They encourage all of us to work together to grow awareness and create innovative opportunities to provide cognitive ramps to accommodate and support those living with cognitive challenges. Across the globe, our nation, and Massachusetts, dementia-friendly efforts are doing just that! And, excitingly, the Andover/North Andover YMCA’s Revive and Thrive and Andover’s Memory-Making Café are leading the way, joining in these efforts to support the more than 120,000 people living with Alzheimer’s and other related dementias in Massachusetts. For additional information, please contact Emily Kearns at emilykearns18@gmail.com; or 978-604-0830.